The British, Canadian and season-ending Abu Dhabi Grands Prix will be among the nine Formula 1 races broadcast live on the BBC in 2014. The coverage also includes the new race in Sochi, Russia, alongside the classic Belgian, Italian and Japanese events. The Malaysian and Spanish Grands Prix will also be live with the other 10 races broadcast as extended highlights. All 19 races will be broadcast live on BBC Radio 5 live or 5 live sports extra and the BBC Sport website. 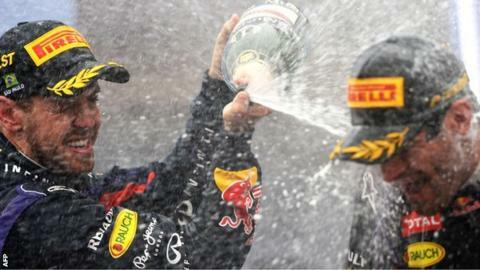 Ben Gallop, BBC head of F1, said: "It has been another great year for F1 on the BBC. "We're now very much looking forward to 2014 and feel we have a strong package for our TV coverage. "This format of both live and highlights is attracting a wide range of viewers and we hope to see even more people tuning in next year to experience the magic of Formula 1." Highlights packages were increasingly popular in 2013, with the German GP highlights attracting a peak audience of 7.7m last season. A total of 27.8m people watched F1 on the BBC in 2013, an increase of 1.2m on 2012. The division of live and non-live races is reached through a negotiation process with fellow broadcaster Sky. Preferred picks are based on a wide variety of factors, with the BBC aiming to put together a strong cross-section of the season that delivers for audiences. Those races not shown live on BBC TV are strongly complemented by extended TV highlights, live radio and online coverage. The BBC's deal to broadcast F1 runs up to and including the 2018 season.